Local infrastructure firm Megawide Construction Corp., in partnership with Indian company GMR Airports Limited, has submitted an unsolicited $3-billion (Php156-billion) proposal for the rehabilitation of Ninoy Aquino International Airport (NAIA) to the government, Megawide said in a disclosure to the Philippine Stock Exchange on Thursday, March 1. The proposal comes weeks after seven of the country’s biggest conglomerates submitted a similar proposal to rehabilitate NAIA for Php350 billion, almost double than that of Megawide and GMR’s. The conglomerates tapped a unit of Changi Airports International Pte Ltd., the operator of Singapore’s Changi Airport, as technical partner. The “superconsortium” includes Aboitiz InfraCapital, Inc., Ayala-owned AC Infrastructure Holdings Corporation, Andrew Tan-led Alliance Global Group Inc., Lucio Tan-owned Asia’s Emerging Dragon Corp (AEDC), the Gotianun family’s Filinvest Development Corporation, the Gokongweis’ JG Summit Holdings, Inc. and Metro Pacific Investments Corporation. That pits Megawide co-founder, CEO and Chairman Edgar Saavedra, one of the youngest rich listers in Forbes magazine’s list of 50 wealthiest Filipinos, against some of the country’s top dollar billionaires. Only 42 years old, Saavedra was No. 31 in the Forbes’ 2017 Philippine rich list with a net worth of $375 million. In contrast, many of the conglomerates that comprise the “superconsortium” are backed by far richer tycoons such as John Gokongwei Jr. of JG Summit, who is No. 2 in the rich list, Lucio Tan of AEDC (No. 4), Jaime Zobel de Ayala of Ayala Corp. (No. 5) and Andrew Tan of Megaworld Corp. (No. 9). Megawide and GMR’s offer to invest Php156 billion to rehabilitate and upgrade the country’s biggest and busiest airport includes the construction of full-length parallel taxiways for the runways in NAIA, construction of additional Rapid-Exit Taxiways (RETs) for the primary runway and extension of the secondary runway. The concession period will last for 18 years. 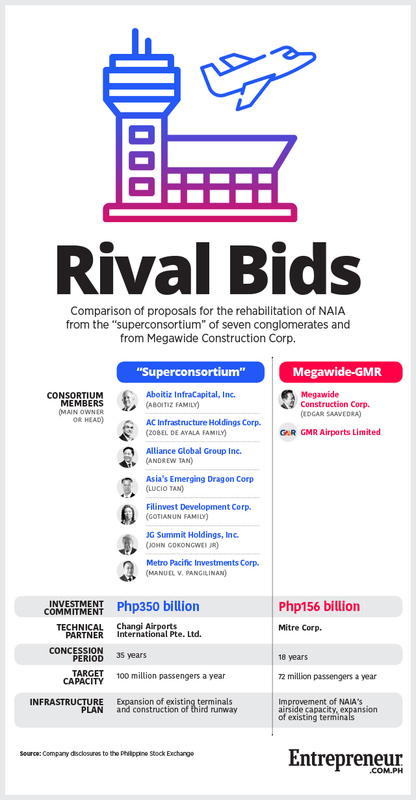 Megawide’s proposal costs less than half of the superconsortium’s offer to invest a total of Php350 billion over the concession period of 35 years. Megawide’s plan doesn’t include building a third runway, a major cost item in the seven conglomerates’ proposal. Once the improvements are completed, the current passenger capacity of NAIA of 30.5 million is seen to double to 72 million passengers a year, according to Megawide. “Within the first four years of takeover, which may even be before the President (Rodrigo Duterte) concludes his term, we want to have solved NAIA’s main problem of capacity. The key is to ensure quick turnaround times and a more efficient use of resources, such as the existing runways,” said Louie Ferrer, one of the consortium’s authorized representatives, in a statement. Megawide said the proposal “prioritizes airfield capacity development while simultaneously enhancing terminal comfort and efficiency.” It will increase NAIA’s airfield capacity to 950 to 1,000 aircraft movements a day, a 30 to 35-percent increase from the current approximate of 730 aircraft movements per day. “As an experienced private operator, we have a deep understanding of the problem experienced by NAIA and we would like to offer our take on the solution,” Ferrer added. Megawide and GMR’s partnership go back to 2014, when the companies won the bid to rehabilitate and operate the Mactan-Cebu International Airport for 25 years for Php14.4 billion. In December 2017, the tandem similarly won the contract to build a new passenger terminal in Clark International Airport in Pampanga for Php9.36 billion. In January 2018, Megawide initially announced that it was set to bid for the right to rehabilitate NAIA with state-owned Social Security System (SSS) after the latter became a 5.07-percent stockholder of the infrastructure company. Ferrer said Megawide started to study a proposal for NAIA’s rehabilitation as early as three years ago.